In January, I had the extraordinary opportunity of collaborating on the creation of a mural with international muralist Benjamin Swatez. 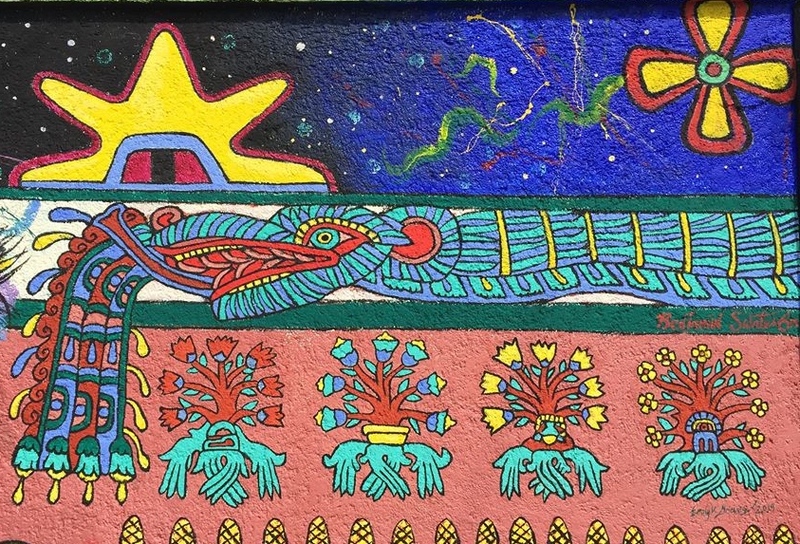 He visited Teotihuacan with a group that came to experience the energies and wisdom teachings held within the indigenous tradition of the 2000 year old pyramids and surrounding archaeological site. 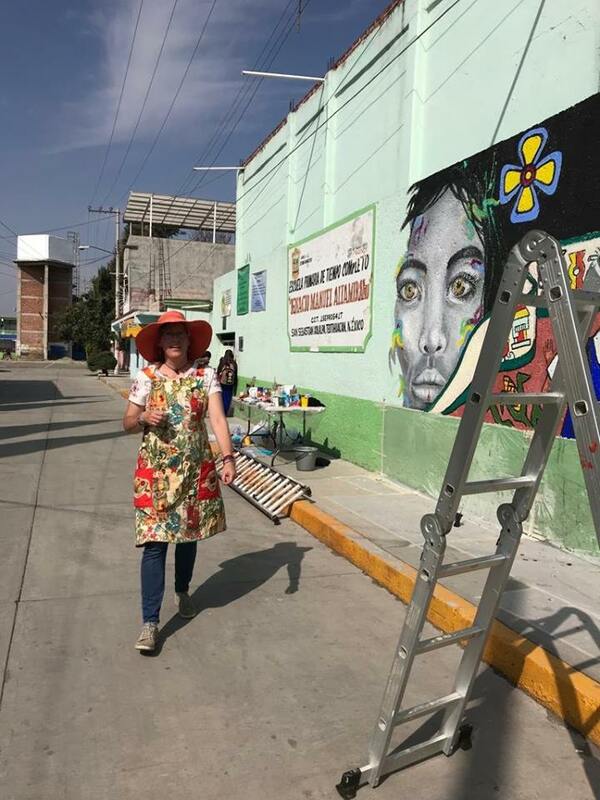 The leaders of the group had asked me to suggest a place in the area to create a mural beneficial to the local community. Despite some initial doubts, I chose to see this as a beautiful opportunity for me to learn from an expert, a great artist, and to stretch beyond my own artistic limitations. I presented the idea to the principal where my son Marco attends, “Escuela Ignacio Manuel Altamirano” in the village of San Sebastian Xolalpa. She loved the idea, with a request to include an anti-vandalism message in the theme of the mural. The village, especially its schools, has seen a surge in vandalism and graffiti recently, so this message, which became, The Voice of Respect, seemed perfect. I asked the principal to select about 20 kids, but not just the “good” students. Given the theme, it seemed especially important to include the kids who are the “problem” students, the ones who are overlooked and never chosen for something special, the kids who are perhaps most likely to commit acts of vandalism down the line. She chose the children accordingly, two or three from each grade, 1st through 6th. While on the way to Mexico from a project in Uganda, Benjamin had sent me a list of supplies to gather. This consisted of 1 gallon of white latex house paint, 2 liters of black, 1 liter each of red, blue, yellow, green and magenta. From my studio, I collected brushes, red oxide acrylic paint, jars, a bucket, masking tape and plastic drop cloth. Upon arrival, my mother-in-law walked him over to my house, and when I opened the door to meet him, all my worries fell away. It was like meeting an old friend! He came into my studio and we immediately started pouring through books and magazines of Teotihuacano murals and symbols. 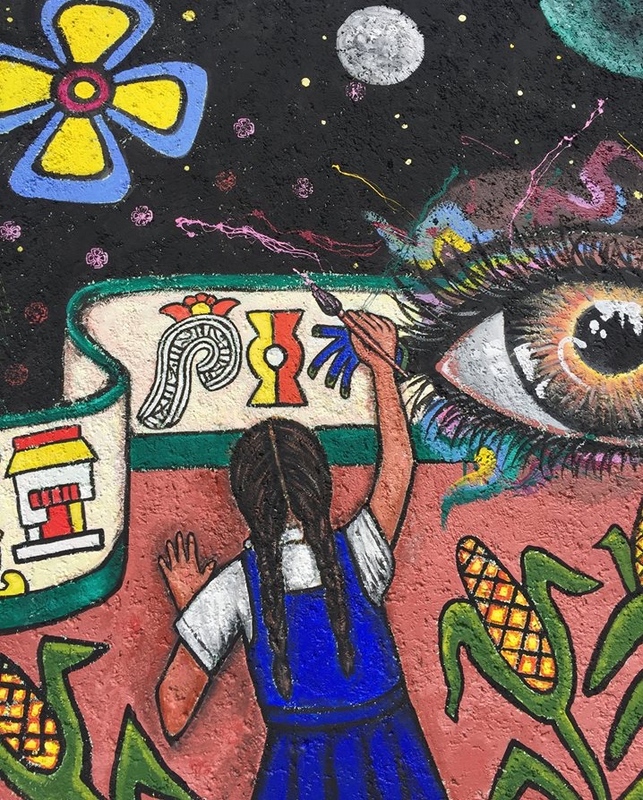 We talked about the history and mythology and mystery of the images created by the ancestral masters of the pyramids, and how important it was for the children here today to understand and respect their own heritage. Then we began brainstorming the visual elements we wanted to include in our mural and sketching the basic composition. It was a true collaboration that flowed easily and effortlessly. The principal gave us the thumbs up on our design, and we begin plotting it out on the wall with charcoal using a small digital projector. The projector was brilliant – it fit in the palm of a hand, had about 2 hours of battery life, and connected to a phone. We took pictures of the drawings on the phone and projected them on a much larger scale onto the wall and traced the lines in charcoal and then with black paint. It was an epic task to complete in just a few hours. Benjamin also painted a large-scale face of a beautiful little girl in his trademark realist style at lightning speed. I was fascinated to see how quickly he worked. By the time the kids came out to help us at 1 p.m., we had our lines, we had paint mixed into cups for them, and we had marked a dot of color in each space so that the kids could essentially “paint by number.” The American adults from the visiting spiritual group that had initiated the project joined us shortly thereafter, coming straight from the pyramids to the school to help. 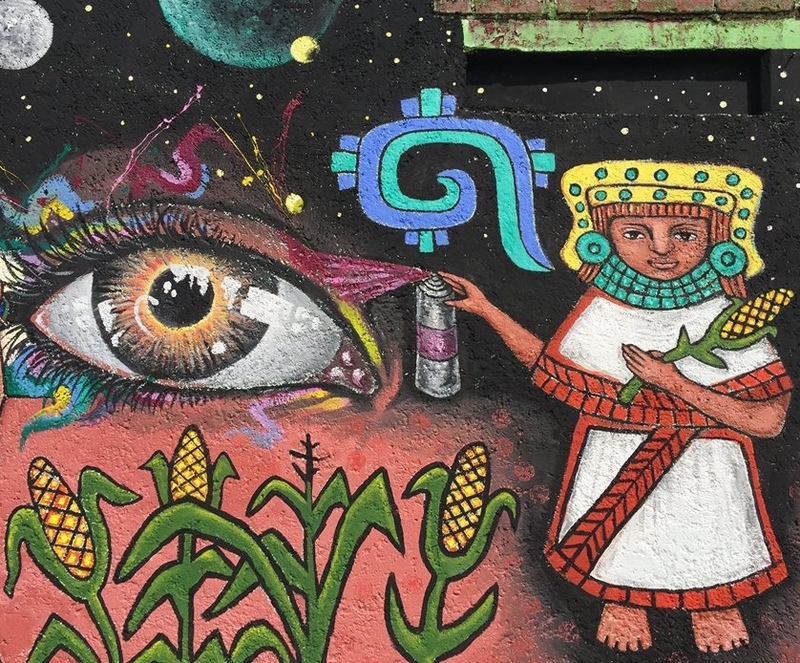 We included a typical Teotihuacana figure in the mural with a “noble speech” symbol coming from her mouth and holding an aerosol paint can directed at a huge eye, to convey this idea that respectful expression, vision and creation lies at the center of a unified harmonious community. 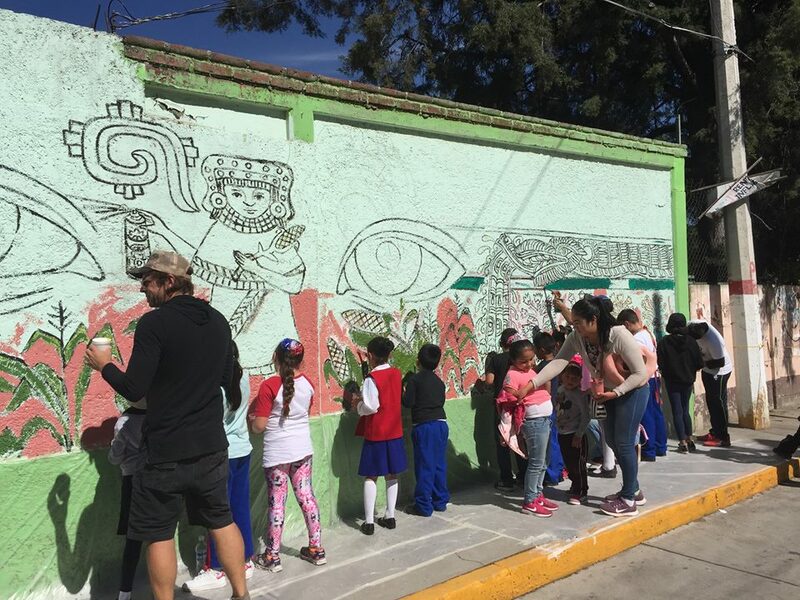 Benjamin speaks Spanish so he introduced himself to the kids (and their parents who had come to watch), and I gave them a brief motivational talk about the theme of the mural – about the vandalism problem and how reconnecting to their ancestral roots and taking pride in their heritage can help the youth learn to express themselves creatively in a way that is positive, beneficial and beautiful in their community. The hour and a half with the kids was wild, exciting, and chaotic, as we had kids of all ages and in any given second I had a little boy or girl tugging at my apron asking me for more paint or a new color. I was relieved when our time was up just to take a breather but also in love with what the kids had so earnestly painted. We had a lovely surprise then – the parents of the kids who had participated had prepared a meal for us! They invited us all into the school yard where they had set up tables and they served us a typical regional meal of chicken mixiotes, rice and beans, with the intention that we “break bread” with the kids. So beautiful. Luc, a friend and colleague of Benjamin’s on his “Goodness Tour,” a global community mural and music mission, shared some songs with the group, and both Benjamin and I had the opportunity to talk in more depth to the kids and parents about the message of the mural. When the meal wrapped up and the kids went home, Benjamin and I stayed to continue working on the mural. There was a huge amount of work to be done still, and time was running short. We spent much of the rest of the afternoon making adjustments to the areas that the kids had painted. In their enthusiasm, they had covered over many of the outlines we had marked and made their own unique, albeit abstract, creation out of our carefully plotted corn. We chose what to keep and what to adjust, and the end result has some crooked but clear corn stalks made by the kids. We painted until late that day. 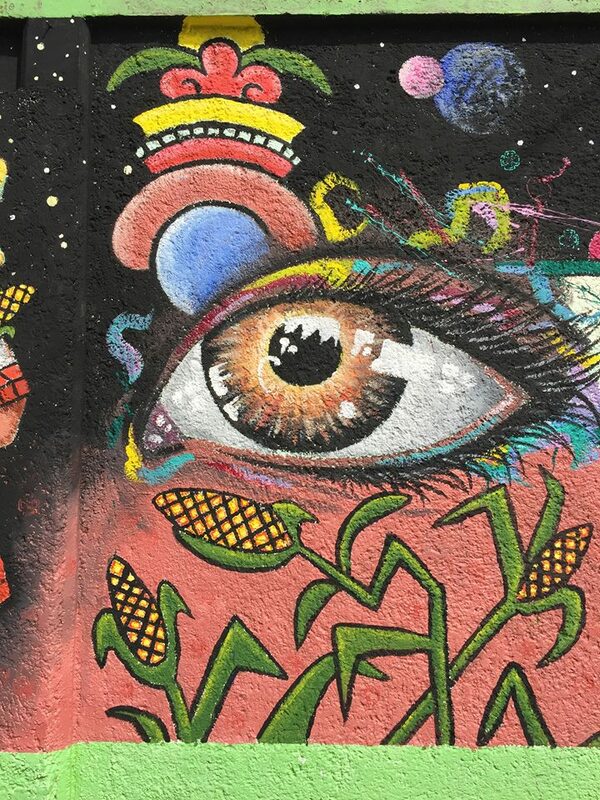 I love the metaphor of the crooked corn stalk symbol – like a child’s life, it may have gone astray but righted itself again into alignment and positive growth toward the light of the sun! The following day, Tuesday, we both arrived early in the morning, knowing that we had to paint like the wind to wrap it all up that day, as Benjamin had a flight to catch at 5 pm. I have never painted so fast in my life. We battled with the rough uneven surface of the wall, trying to get clean lines and clarity in all of the bumps in the porous surface. There were moments when I struggled with technical things, how to portray a shadow correctly, or a hand, and Benjamin never hesitated to take a moment to help me, in spite of the time pressure. In fact, he remained calm and tranquil throughout our hasty painting, never letting on if he was stressed or nervous, never losing his patience. His friend Kosar, an Iranian woman and immigrant to the U.S., helped us out with retouching lines all day, which was a huge support. My son Marco also stayed for hours after school each day to help out with the lines and retouching. Benjamin reminded me frequently to go stand across the street to get a better perspective on our work. So funny, because I often tell my own students this in the studio, to stand back from the canvas for a better view, but I forgot all about that sage advice with the huge scale of the mural. 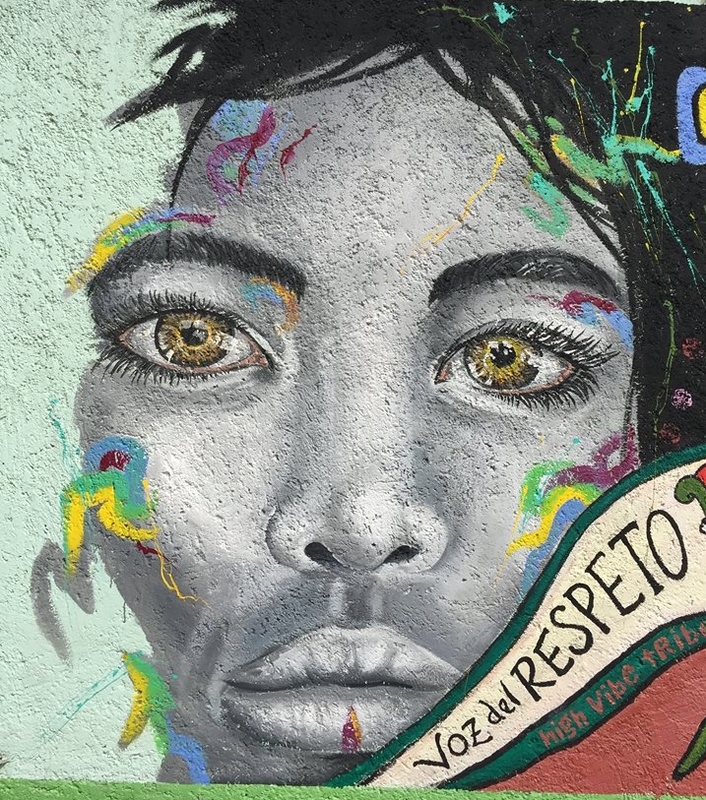 We added in the title of the mural “Voz del Respeto” – “Voice of Respect” and signed it with our names and the name of the group that dreamed the project into being – High Vibe Tribe. We painted right up to the very moment that Benjamin had to go hop in a taxi to get to the airport. He literally went running down the street with the longer of the ladders we had used, hoisted on his shoulder like a true soldier of Intentional Creativity, to deliver it back to its lender before racing to the airport. I stayed at the school with my son plodding along on the finishing touches till late. On Wednesday, I felt rather lonely without Benjamin as I returned for a final day of completing the mural. This involved cleaning up any more lines and details, applying some final symbols to the sky, filling in some uneven color, and finally, applying a coat of sealant to the entire mural to protect it from the elements, the sun, and from potential graffiti from anyone who might not have understood the message – we hope that never turns out to be the case, but we wanted to protect it nonetheless. Emily K. Grieves received a BFA degree in art from the University of Montana in 1993, followed by study of art history in Berlin, Germany, as a Fulbright scholar. She lived in San Francisco, California, for 10 years where she began exploring symbolism, mythology, and ritual in her artwork, drawing inspiration from the celebrations and mysteries of life. 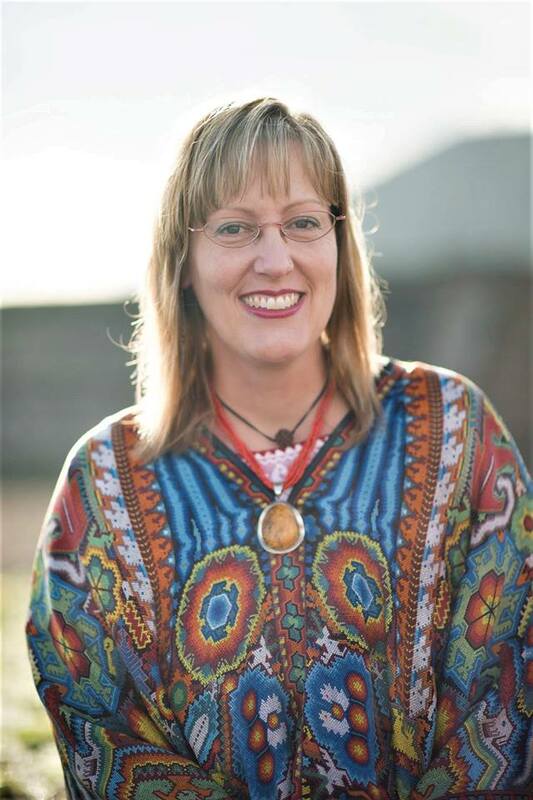 She has been a practitioner of shamanic healing and hands-on energy work since 1997. As of 2004, she makes her home in Teotihuacan, Mexico, where she has painted murals at the Dreaming House spiritual retreat center and has created a body of artwork influenced by the cosmological imagery left in the ancient pyramids and by her relationship with her Muse and the Divine Feminine. 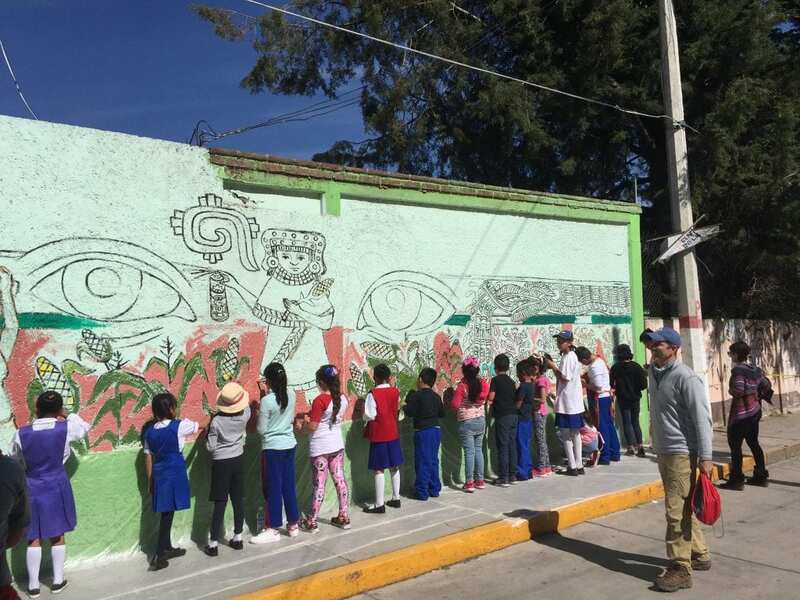 In 2014, she opened her studio Taller de Arte El Refugio, in Teotihuacan. Wonderful astonishing work! So rich, visually and in its community..it looks like it should have taken a team of people many weeks! Really well done !